Did a nice 6 1/2 mile run yesterday at lunch - nothing big. It rained cats and dogs all last night. Thunder and lightening. The rains stopped around 6 AM. It was hard to get out of bed but I decided to head out to the race site. We do not get many races that are actually in town. I got to the race site at about 7:15 - there were not many people there but I knew several including the race director. The race was scheduled to start at 9 AM. Sam, Chris and Steve all showed up shortly. I registered and was the first to set up in transition. I got the best place. 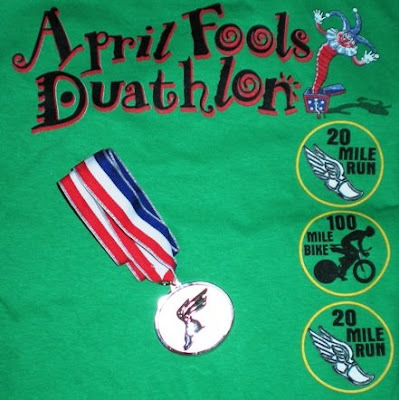 The race would be a 2 mile run, 10 mile bike and another 2 mile run. I was strategizing with Steve on how hard to go out. Sam had said pretty much to go all out. Steve and I were debating how hard to do the first run so that we did not blow up on the bike. The race got started about 30 minutes late. I did not have a lot of nervous tension like I can sometimes have - I think the tension is mainly anticipating the swim. The air was thick at the start of the race but the rain was gone. There were mud puddles all along the run course. I did not even try to stay with the front runners - I know better. The leader of the race was Jacob (twenty something fast guy) who just won the Sunfish Duathlon last weekend. He had a big X on his back for Sam to chase - Sam would be on his road bike with aero bars (his Scott Plasma developed a crack and was sent back to the factory). Steve - the guy that I paced off of in my last 5k - the guy that pulled away by about 30 seconds was 20 feet ahead of me. I was watching my heart rate monitor. I did not want to red line during this first run and fade on the bike. I stayed in my HARD EFFORT zone and let the front runners pull just a little ahead of me. I entered the transition area after the 2 mile run at 11:53. Having the best transition spot meant that I could continue to run through the transition and not have to run with my bike much. My transition was okay - a run through the transition, a shoe change, helmet on and run up a short hill with the bike - total 1:02. The bike course was very wet and there were a few sharp turns leaving the subdivision. I got up to speed pretty quick and was pushing hard. Once we got out on the highway it was all up hill. Not steep just hard up hill! I was grinding away and just thinking to my self that at least it is an out and back so I get to ride down the hill. Chris passed me going up the hill and then I passed Steve on the same hill - yes this was a long hill. I was stuck in no man's land. The leaders had pulled away from me and I had pulled away from Steve. Thoughts of missing turns entered my mind. It was a straight out and back on the highway - no chance of missing turns but I thought about it. At one point I had to drop to my lower front crank. I have not had to do this in a while. A little demoralizing but you do what you have to do. I hit the turn around and I was hurting but feeling good. The down hills came up quickly and I was flying. The chip and seal roads did not help. I do not carry a cyclometer on my race bike but people after the race said that they hit 40 MPH - that seems a little high, but... I continued on to the transition, the roads were much better in the subdivision. I hit the bike dismount line with a bike time of 29:50 - about a 20 MPH average. My next transision was 52 seconds and I was back on the same 2 mile out and back. I was feeling tired but running pretty good. I just kept my heart rate in my LT zone and cruised. There was one runner about 50 feet in front of me and a guy named James about 20 feet behind. James is in my age group. I just needed to keep him off of me. I just trucked this run out. The run was the same as the first but you ran through transition to the finish line - so maybe another 150 feet. This run time was 13:29 - about a minute slower than the first run. My total time was 57:07. Sam ended up winning the race and the Jack 'N the Box trophy. I'm not sure but I think I finished around 8th. I was pretty sure that with Sam winning I would be first in my age group but I only placed second. I forgot about Robin - another fast guy in my age group. I'm probably a little faster than Robin on the bike but his run blows me away. All in all a good first Duathlon. Sorry I missed this race, sounds like it was way fun and you did well! OK, I was wondering where the April Fools part came in? I was hoping they'd throw another mile on ya at the end or something...haha, April fools, you got another mile;) Nice job and congrats. Sounds like you did great out there! It's always good to start the season strong.